There is a bright side! We bought their house from them- as is and for cash! I would say that we helped make a bad situation good very quickly. But what if you don’t want to sell your house and you want to correct the issues? Good news is there is solutions for this type of problem and we’ll help you navigate your options! Identify where water is coming from! This is the most important part of fixing the issue is finding out where this water came from in the first place. Is it a plumbing leak or a roof leak? A pipe burst or a main water valve? Once you can identify the issue, then we can correct. If it’s a plumbing issue, turn the water off. If it’s a roof leak, use a bucket to catch water until repairs can be made. Stopping the water is the most important part. You’ve identified where the water is coming from so now you need to call the appropriate contractor to come fix it. They will need to come out and give an estimate for the work to be completed. Be sure that they put this estimate in writing and they provide proof of license and insurance. We would even suggest going the extra steps to ask for reviews from prior customers. Hopefully you caught this leak early and don’t have to worry about this part but just in case, if mold is now present, you need to re mediate the issue. 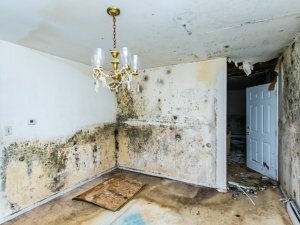 Getting rid of mold isn’t as scary as people make it sound. If the mold is just on the surface, you can get a specific cleaner that will take care of it. If it’s in your walls, you will need to cut that part out and replace the insulation and drywall. It may be easier to call a mold remediation company that can come in and do all of this for you. This way, you will have peace of mind that it is done correctly. Here at Mac Home Development, we are here to help! That means we can give recommendations for contractors to fix the problem or we can give an offer to buy the house so you don’t have to worry about it. Either way, we want to do what’s best for you!